Want to get away on holiday but worried that your funds won't stretch that far? With a Beat the Brochure discount code you can enjoy fantastic savings on a wide range of escapes to fantastic destinations around the world. Whether you want luxury all-inclusive in the Caribbean or a cheap and cheerful budget break to Southern Spain, Beat the Brochure voucher codes are a great way to save the pennies. Founded in 2004 in London, UK, Beat the Brochure is a dedicated online travel agent that aims to let budget-minded holiday-makers find the best prices on a wide range of holidays. Offering consistently lower prices for the same holidays than high street travel agency brochures, Beat the Brochure allows travellers to save more money for fun while they're away. Drawing on the experience of over 200 dedicated and knowledgeable team members, the company has been beating brochure prices online for 10 years. Beat the Brochure works by allowing customers to search flights, hotels and package holidays from a wide variety of providers all in one place. By giving customers access to the same technology that high street travel agents use to compile holidays, Beat the Brochure allows them to take a flexible and bespoke approach to booking their dream holiday. The company also maintains excellent relationships with some of the top names in the travel industry such as Thomas Cook, JMC and First Choice – not to mention the best airlines, hotels and car hire companies - allowing them to negotiate the very best deals on your behalf. Beat the Brochure's comprehensive online travel agency offers wide search parameters to ensure that everyone can find the holiday that's right for them. Looking for inspiration? Why not simply choose a category that takes your fancy – such as 'Beach holidays', 'Family holidays' or 'City breaks' – and see what great deals you could take advantage of today? Know where you want to go? Beat the Brochure will let you search for the best package holidays, hotel rooms or flights to hundreds of destinations around the world. What's more, Beat the Brochure allows you to book your holiday with total peace of mind. Operating under a Travel Trust Association license, the company is covered by the most complete consumer protection the market has to offer, while an ATOL license protects you from losing your money or being stranded abroad. Want to book your next holiday with Beat the Brochure? With a Beat the Brochure discount code you can enjoy fantastic savings on a wide range of escapes to destinations worldwide. From city breaks with friends to romantic getaways for two, a Beat the Brochure promotion code will help you get away from it all for less. Browse our website until you find a Beat the Brochure discount code that suits you, then navigate to their website to begin shopping. Enter your desired holiday details and click 'Beat it'. Choose your accommodation and click 'Select room'. Check your holiday details and click 'Book'. Enter your Beat the Brochure promo code where applicable. 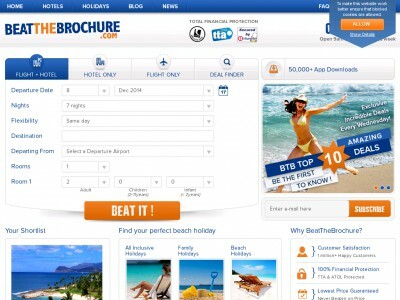 Enjoyed shopping for bargain holidays at Beat the Brochure? Why not find more great deals on places to stay around the world with Booking.com or Hotels.com? Or, if those aren't right for you, you'll find plenty more stores to browse in our Travel section. Travel category offers plenty of interesting discounts. Apart from voucher codes to Lowcostholidays you'll also find there voucher codes and rabates at Thomas Cook, Thomson, Very Cheap Holidays and many other popular stores. Enter your Beat the Brochure discount code where applicable. Fill in your passenger information and any special requests and click 'Continue booking'. Enter your payment and billing details to complete your booking. Need to contact the team at Beat the Brochure? Whether you have a question about your booking, want to find out more about a specific destination or hotel or simply want to know how you could make great savings with Beat the Brochure voucher codes, you can contact the Customer Services department by telephoning 020 7741 1246. Want to find out more about what's happening behind the scenes at Beat the Brochure? Why not follow the company across all your favourite social media platforms? You'll find lots of fun and exciting content including travel articles and ideas, competitions, special offers and more. You can also use these pages to find out more about saving money with a Beat the Brochure promotion code. Don’t forget to check them regularly, as you can never be sure when a free Beat the Brochure promo code might be waiting for you! Buy now online at www.beatthebrochure.com. For our first holiday away with the kids, we wanted a stress-free all-inclusive break – but everything we looked at was too expensive. Luckily, I found a Beat The Brochure promo code online. I used my Beat The Brochure voucher codes at beatthebrochure.com to get a great deal on an all-inclusive holiday to the Algarve. We had an amazing time, and came back tanned and relaxed – all thanks to my Beat The Brochure promotion code. Why not treat your family to a bit of sun with a Beat The Brochure discount code?